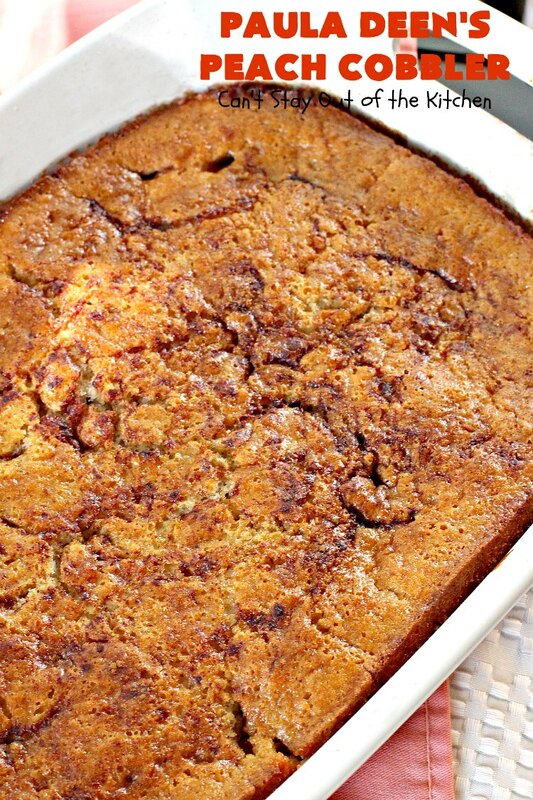 Paula Deen’s Peach Cobbler is a recipe you just can’t do without! Well, dear friends, we are finally there. Today is my last of 40 peach recipes that I’ve posted in the past couple of months from baking peaches from our six peach trees out on our back property. 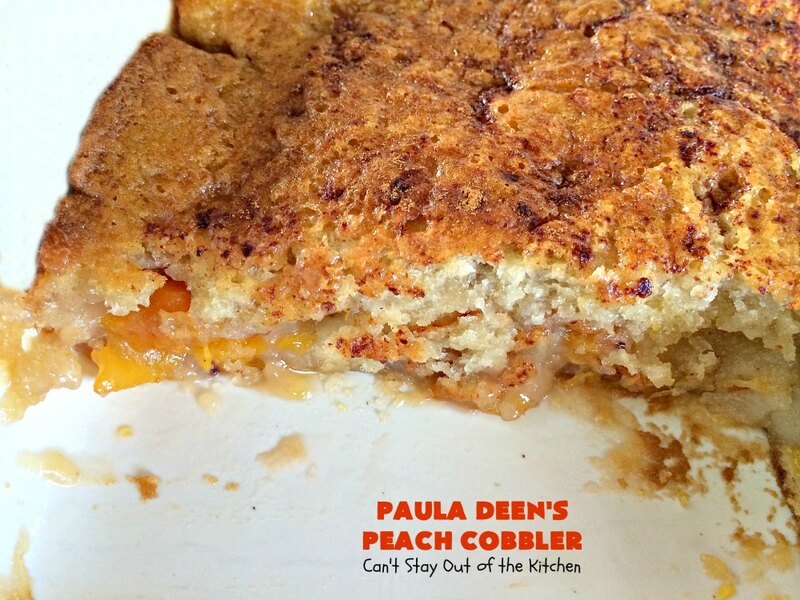 Paula Deen’s Peach Cobbler–enough said. 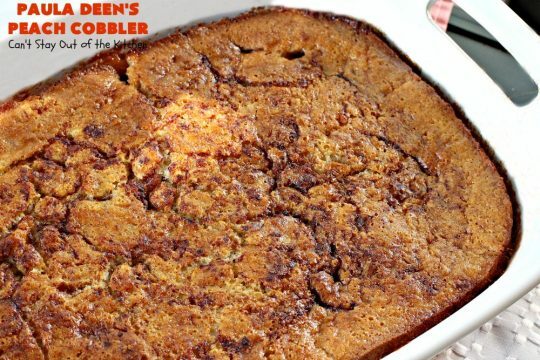 This cobbler is really fun. You start with melted butter on the bottom of the baking dish. Then you make a crust mixture and pour it into the melted butter (without stirring). A peach pie filling is made on top of the stove and then poured over top of the topping (again, no stirring), followed by a sprinkling of cinnamon on top to finish it off. The cobbler bakes up to perfection. It’s great served with whipped whipping cream, non-dairy whipped topping or [news flash] ICE CREAM! Yay. 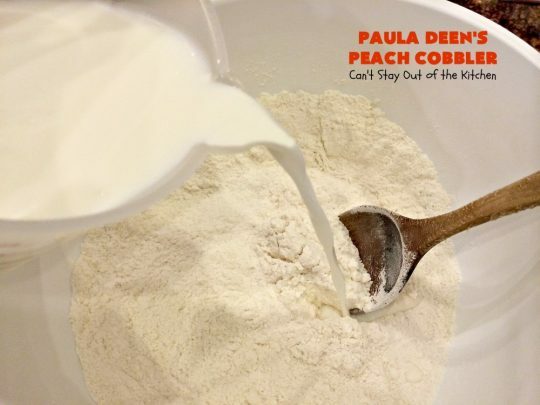 What can you say about a Paula Deen recipe? They’re all fantastic. The nice thing about this recipe is that it’s really easy. E-A-S-Y! Yet the payoff is quite good. Quite frankly, I don’t see why you couldn’t use fresh, canned or frozen peaches in this recipe. I think all would work quite well. 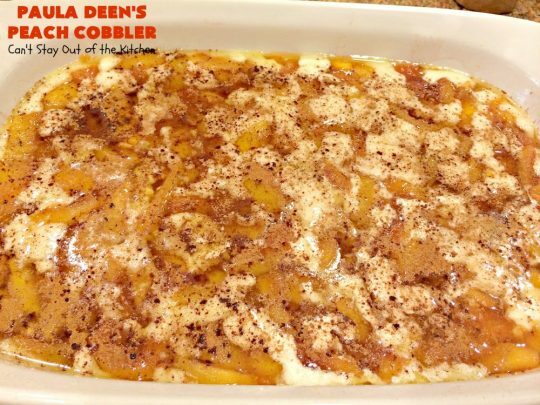 Paula Deen’s Peach Cobbler has nice crunch from the topping and is filled with tender, juicy peaches making it a delectable dessert your family is sure to love. It’s also one of those magical cobblers that you assemble without stirring the ingredients. Everything just bakes up wonderfully, magically. Baking up all those wonderful peach desserts in July and August was a hoot. Two solid weeks I baked from early morning ’til past dark making goodies, taking pictures, and packing up the goodies to send to friends. I could never be a full-time caterer. Being on my feet like that for hours on end is exhausting. I also spent several days baking goodies before we left for our New York City meetings and vacation at the end of July. It was a lot of work. Most of the time I made three or four different desserts a day. While that doesn’t sound like all that much, some desserts were definitely more labor intensive than others. Taking pictures added a lot of time, and then packing up the goodies, and then washing dishes….and more dishes…..and more dishes! You get the idea. I told you I was going to give you my personal favorites after I got everything wrapped up, so here goes. Even though my Double Crust Peach Cobbler has been my favorite cobbler for years (and I made it during this whirlwind round of baking), out of the nine different peach cobblers I made, my hats off to Magic Peach Cobbler. It was so different, had the most delicious crust I’ve ever eaten, and it was super easy, too. Out of the three pies I made, hands down, my Mom’s Peach Pie recipe is, and always has been, the BEST! It is so delectable. I can never get enough of this pie. Out of the 12 cookie recipes I made, I loved the Peach Cobbler Cookies. They had a lovely texture and taste. But I have to give the Peach Spice Cookies an honorable mention. Anything with frosting on top can’t get away without an award from me! Out of eight different bars or brownies, I have a tie. Both were so drool-worthy I can’t decide between the two. Peach Crumb Bars were sensational. I liked everything about this bar and could have consumed the whole pan in a heart beat! Peach Bars with Almond Drizzle were also spectacular. I kept licking the icing as it drizzled down my fingers. Yum. Out of the six cakes and coffeecakes I made, the Butterscotch Peach Snack Cake was by far my favorite and I’m a cake lover extraordinaire! So it had to be pretty special for me to consider it above the other recipes. The butterscotch icing put this cake over the top and made the difference. My fresh Peach Pie Crust Cinnamon Rolls were also mouthwatering. Instead of using jelly or jam in this recipe I made up my own filling with fresh peaches. They were terrific. So there you go. 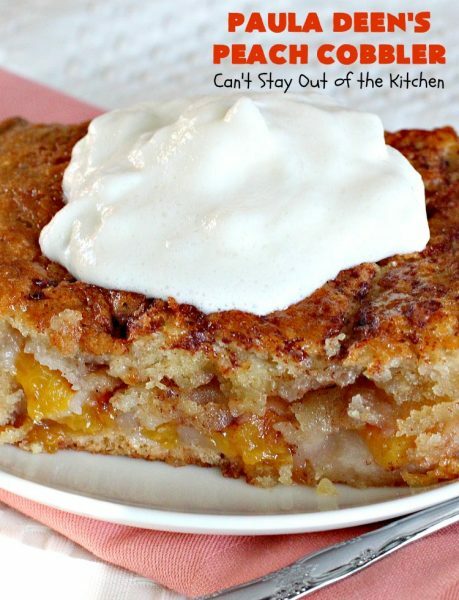 40 fabulous peach dessert recipes, and my own personal favorites. I sure hope you’ll try a few of them….maybe more than a few. 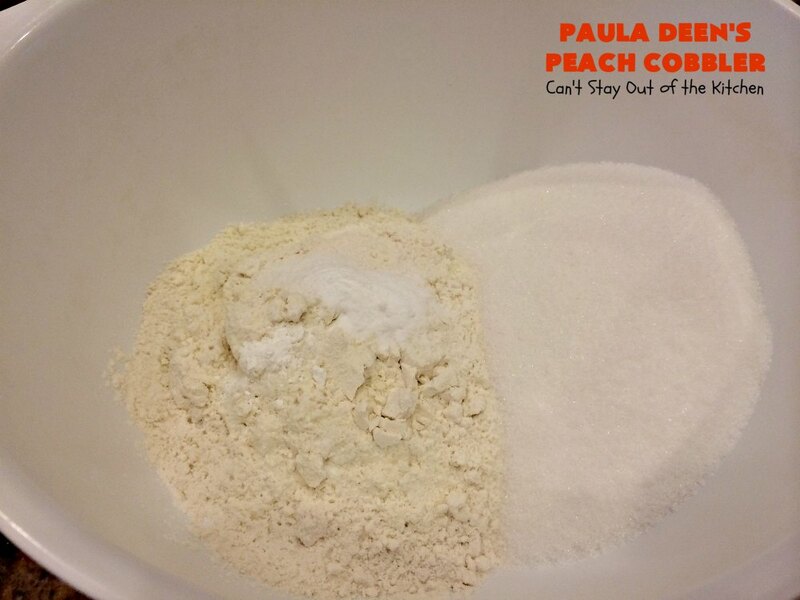 So now we conclude the peach desserts with Paula Deen’s Peach Cobbler. 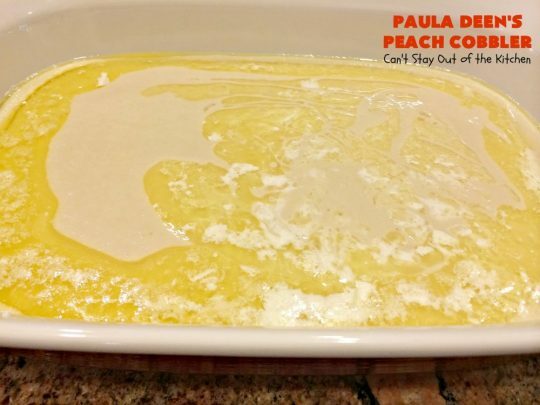 It’s a great recipe to use up peaches, and if you enjoy peach desserts as much as I do, then you ought to give Paula’s recipe a try. I made a few changes since I rarely buy self-rising flour any more. 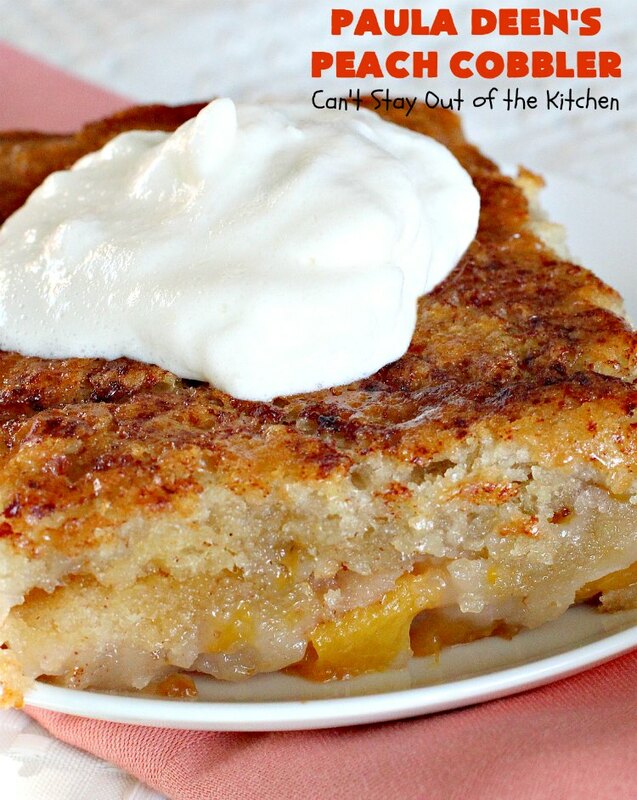 If you’re looking for a tasty peach cobbler recipe that’s quick and easy, this is a good recipe to use. Be sure to stock up on ice cream because your family is sure to come running when they smell the fragrant aroma of peaches baking in the oven. They, and you, will be smacking your lips in delight after one bite of this tasty dessert. 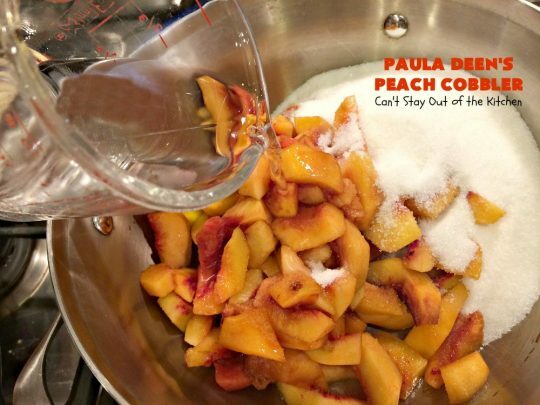 Paula Deen’s Peach Cobbler is quick and easy. This cobbler is tasty with or without a topping. 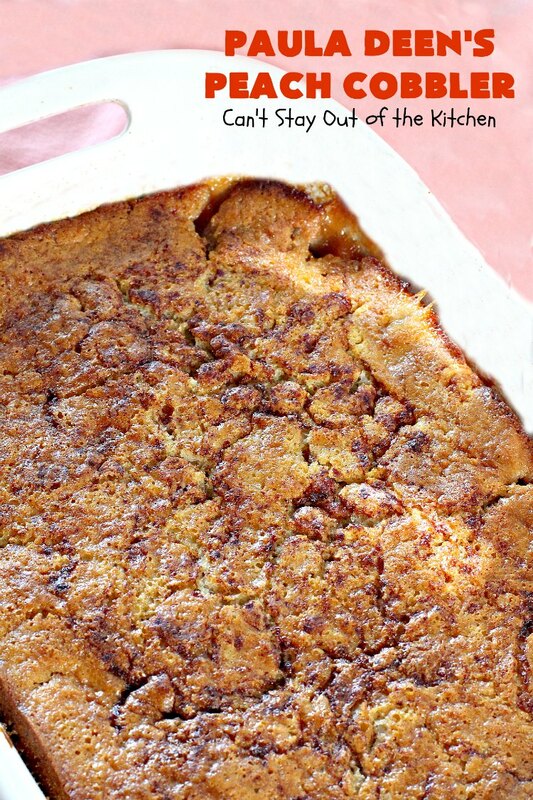 This lovely recipe makes it’s own magical crust. Combine sliced peaches with water and 1 cup sugar over medium heat. Bring to a boil. Lower heat and simmer 10 minutes. Meanwhile, place UNBLEACHED all-purpose flour in a mixing bowl. (Bleached flour toughens baked goods). Add remaining cup of sugar, salt, baking soda and baking powder. Stir to combine. Add milk slowly so lumps don’t form. 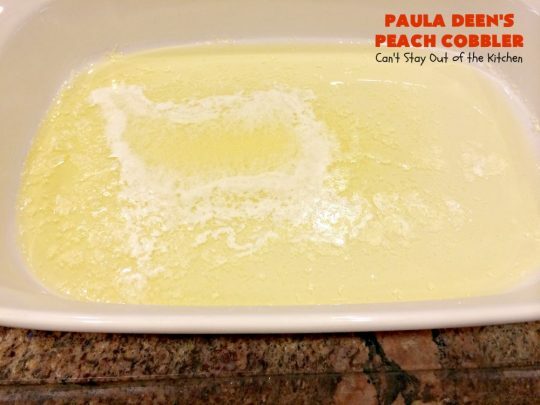 Melt butter in a glass baking dish. Evenly pour flour mixture over butter in baking dish. DO NOT STIR! 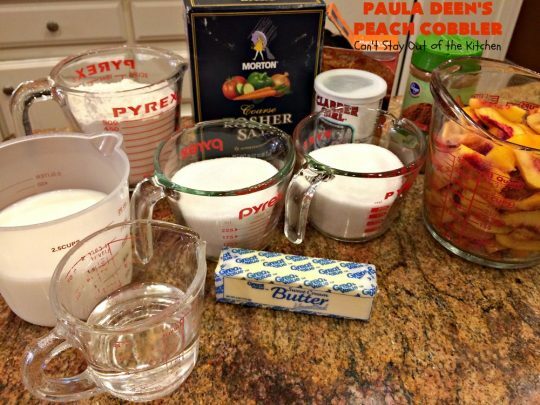 Add cooked peaches and spread as evenly over the flour mixture as possible. DO NOT STIR! Sprinkle with cinnamon, as desired. Bake at 350 for 35-45 minutes or until done. 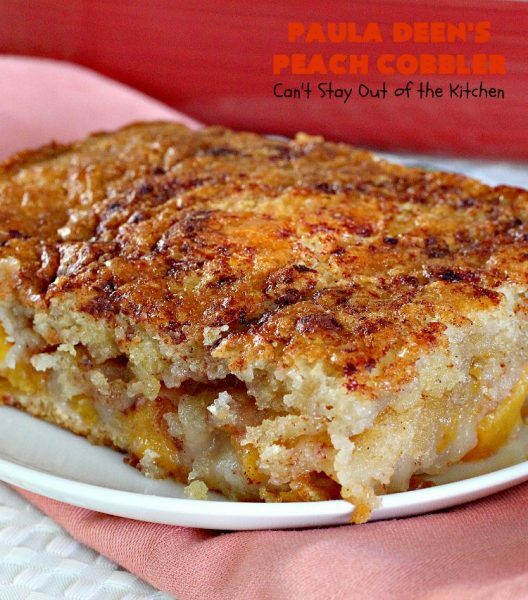 This easy cobbler will be gone in a flash! If you enjoy peach cobbler, you’ll love Paula Deen’s version. 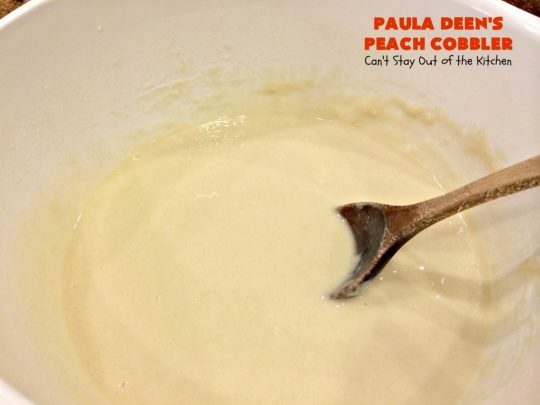 Serve Paula Deen’s Peach Cobbler warm with ice cream, whipped cream, or non-dairy whipped topping. This tasty cobbler is quick and easy and makes it's own magical crust because you don't stir the different layers as you pour them into your baking dish. Combine peaches with one cup sugar and the water and bring to a boil. Melt butter in a 9x13” glass baking dish. In a mixing bowl, stir to combine flour, salt, baking soda, baking powder and remaining 1 cup sugar. Add milk very slowly so lumps don’t form. Continue to stir in milk a few tablespoons at a time until thoroughly combined and mixed. Evenly pour batter over melted butter in baking dish. Evenly spoon peaches and syrup over top of the batter in the dish. Sprinkle with cinnamon, as desired. Bake at 350° for 35-45 minutes or until set. This tasty cobbler is quick and easy and makes it’s own magical crust because you don’t stir the different layers as you pour them into your baking dish. Melt butter in a 9×13” glass baking dish. 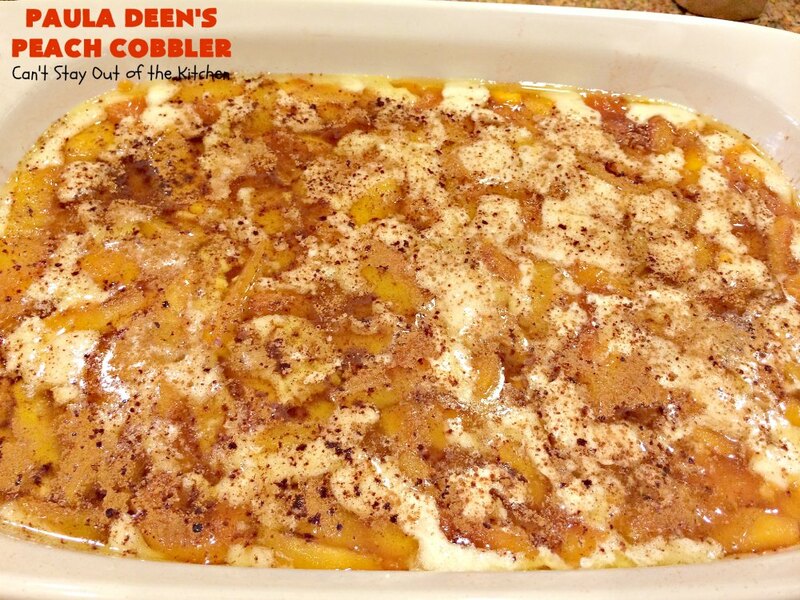 Doesn’t Paul Deen’s Peach Cobbler look delectable? 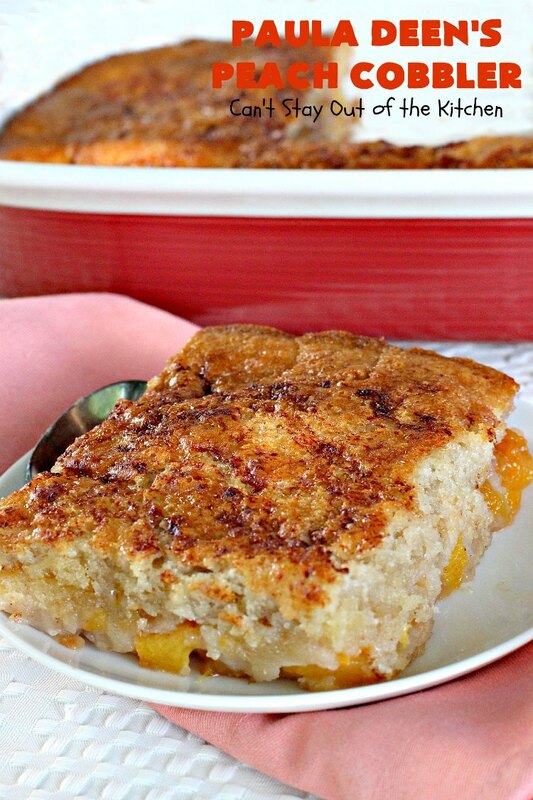 Paula Deen’s Peach Cobbler is the perfect dessert for summer potlucks, backyard BBQs, or grilling out with friends. Is the water, sugar necessary if using canned peaches? Hi, Christine. I’ve never made it with canned peaches before. If you’re using peach juice from the can that can probably take the place of any water. I would still add some sugar – but probably about half the amount stated. But then, I like things sweet. Can I use canned peaches? If so, how much liquid do I need to have on the peaches for the cobbler. I’m disabled and need to make this as simple as possible. Hi, Fawn, you can use canned peaches but I would drain all of the liquid from the peaches before using. You can even pat the peaches down slightly with paper towels if the peaches seem excessively moist. Can you use canned peaches in place of fresh peaches? Hi Judy. I think you can. I would drain them really well before using. I am doing this with a triples berry mixture and gluten free flour and I hope it turns out well. Hi, Heather. I’m sure it will turn out terrific! 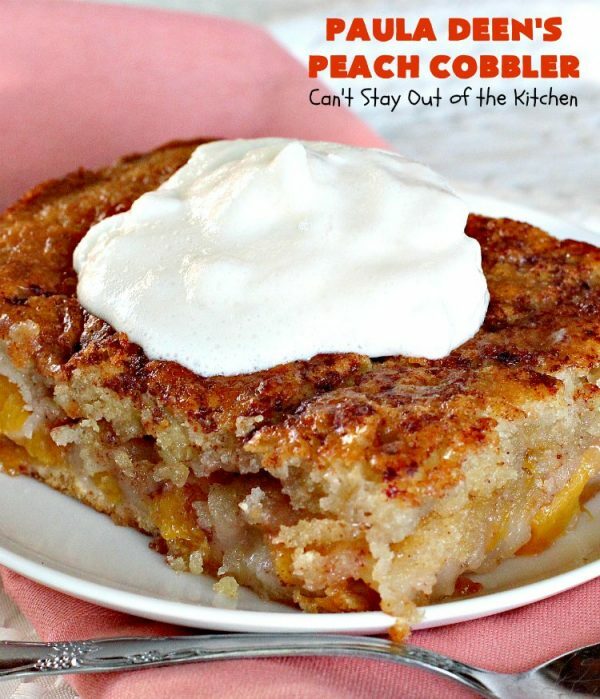 I have tried several cobbler recipes and this one is the best! I like them with a firmer top and soft underneath, not mushy. So glad you enjoy the recipe, Vikki. Have a great weekend. Hope you enjoy it, Ronnie. It’s really simple and easy. Have a great week.